Anika and Shivay feel their commencing separation. Her bracelet gets stuck in his coat. They have similar moment like before. Shivay angrily frees her bracelet and leaves. Shivay gets dressed as the groom. Anika tries Tia’s outfit in Tia’s absence to check the fitting and get alteration. Shivay gets mesmerized seeing Anika. Anika and Shivay have equal ego. Anika asks Shivay does he have nothing to say. Shivay says no. Anika angrily throws water on Shivay’s face, just like their initial meets. Shivay gets thinking about Anika and his emotions, while Anika stands crying. Anika’s tears expresses her love for Shivay. It’s a very emotional moment between the two. Shivay’s heart wants to believe Anika’s truth. Shivay has sensed Anika his love. Both Shivay and Anika have tears in their eyes. Finally, Shivay will be marrying Anika. In a very intense love realization, Shivay will understand his feelings for Anika. By the deep misunderstandings planted in his mind by Daksh, Shivay will be just protecting Anika from Daksh, and also have a madness in mind to hurt her with his anger. Shivay and Anika’s marriage will happen, by Shivay swapping the bride and forcing Anika to marry her. What makes Shivay helpless to take the drastic step and force Anika for marriage? Shivay and Anika feel their love story is left incomplete. Their story will complete in the mandap. There will be big twists in the show when Shivay and Anika get married. The family will also be shocked seeing Anika in Tia’s place. Anika has taken all her life decisions on her own, and when the marriage decision is taken against her wish, how will Anika accept the forced marriage? Shivay and Anika’s moments will be seen more post their marriage. 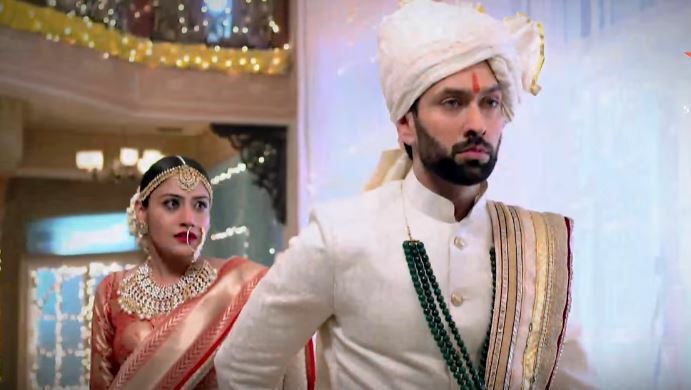 The love-hate track will be starting in Ishqbaaz. Keep reading.